Eight Late Closer champions will be crowned at Hawthorne this weekend and after the first two series legs, it’s clear that the Brett Wilfong Stable has a major threat in a pair of them, both with Kyle Wilfong in the bike. In Friday’s $11,200 Daryl Busse trot series finale, the Wilfong Stable’s 4-year-old trotter Never Says That, is expected to be a prohibitive favorite and taking the first two legs of the series and in each he started from the furthest outside post in each. The Trenton Watson Stable’s Broadway Mojo looks to be ever Never Say That’s primary threat, after racing first over to the Wilfong trainee in the last quarter of the mile last week, when the Issac Love driven trotter dropped a photo decision. On Saturday’s $13,800 Bob Larry showdown, Wilfong has You’remyhearthrob going to the gate in search of back-to-back wins. The family’s homebred 3-year-old pacer lost a narrow head verdict to Sagebrush Shocker in the first leg, but held off his rival in comfortable fashion in round two, with a career best time of 1:54.4. Et Tu Brute (Bobby Smolin), from the barn of Gerald Hansen, stepped up in his Bob Larry leg last Friday, with a 1:55.3 clocking a new fastest mile for the 4-year-old ICF gelding pacer and showing he could be a force to be reckon with in this Friday’s final. 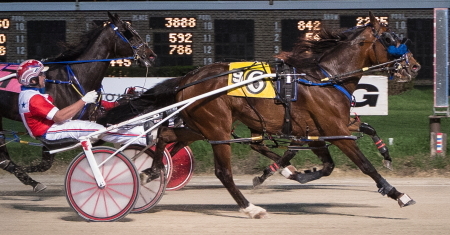 The 26-year-old Wilfong, also has a live drive in Saturday’s $12,200 Mike Paradise championship after steering the 70-1 longshot Fox Valley Sinful to his huge upset and doing so despite the Joel Smith trainee leaving from the 10-hole with an 11-post trailer. Kyle also drives the 3-year-old filly Tempest Heart, from the barn of trainer Dave Rowney, in Friday’s $12,200 Dave Magee final. N.O.C. Candidates Named: The nominations have been posted on the Hawthorne web-site by the Race Office for the Night of Champions ICF stakes. They can be found at www.hawthorneracecourse.com under the “Horsemen” category. The Robert F. Carey stake for 3-year-old state-bred pacing colts and geldings tops the list with 39 nominations, followed closely by the Plum Peachy for sophomore pacing fillies with 34. The 3-year-old Beulah Dygert for fillies has 22 eligible trotters, while the Erwin F. Dygert for trotting males lured 19 candidates. The numbers for the 2-year-old stakes are respectable. As expected, the freshmen pacing events are the highest. There were 35 nominees for the Incredible Finale (males) and 30 eligible fillies for the Incredible Tillie. The 2-year-old trots came up with adequate nominees as well. The Fox Valley Flan stake for fillies has 29 applicants while the Kadabra for colts and geldings saw 27 trotters nominated. The first legs of the Night of Champion stakes will be contested next weekend, with the Carey divisions going on Friday, May 25th, the Plum Peachy divisions on Saturday, May 26th and the two Dygert events on spread out on the Sunday, May 27th program. 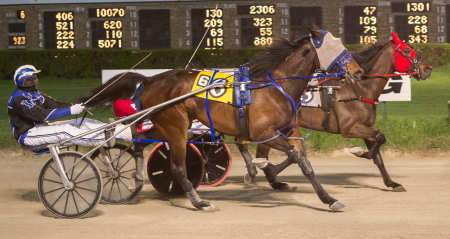 Casey on Fire: After the first two weeks into the summer meet, driver Casey Leonard is off to a sizzling start. The 40-year-old Harvard, Illinois native, has brought home 23 first place finishers in 68 drives, that’s a 33 per cent winning clip. No other driver at the meet as yet to reach double figures. Taser Gun, who starred for many years racing primarily in Illinois, died Monday, May 14, at his home at the American Standardbred Adoption Program (ASAP) in De Soto, Wisc. Taser Gun, who retired from racing in 2007, was 23. Taser Gun had become stricken the day before, being discovered laying in a creek. Under coaxing he eventually was able to stand up and return to his stall, and ASAP director Susan Wellman said when she checked on him at 7 a.m. on Monday he was up and about and she felt relief in that he appeared to have recovered. However, four hours later he was found dead in his stall. Taser Gun came to ASAP after his retirement after a nine-year racing career in which he won 69 of 147 races and $1,158,893 for owner Cunningham Racing Inc. He set his lifetime mark of 1:49.2 in 2000 at age five at Balmoral Park. That same year he paced two sub-1:50 miles in less than one week, capturing a colt stakes elimination at the Illinois State Fair in 1:49.3, which was followed four days later by a 1:49.4 victory in the final. A son of Henry Letsgo, Taser Gun amassed his earnings competing primarily in the free-for-all ranks and Illinois conceived-and-foaled races. When Taser Gun won the $100,000 Dan Patch final in 2004 at Balmoral Park, it was his richest-ever victory. 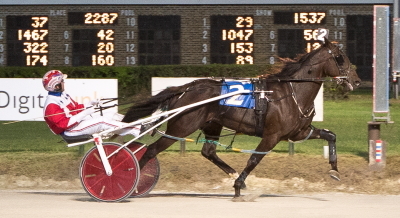 Taser Gun made several appearances after his retirement, including in 2014 when ASAP brought him to the Illinois Horse Fair where he was driven by trainer-driver Rick Schrock and accompanied by his longtime trainer Bob Walker and family. If one Open III Trot is a worthy feature for a Sunday card then two must be twice as good for Hawthorne horse players. That’s the case for tonight with a pair of quality trot events on the 11-race program. Both $7,200 Open II trots were handicapped by groups with the fourth race first division the stronger of the two. Last week’s winner Primed N Powerful was assigned the outside post in the seven horse field after a comfortable four-length victory. The 1:54.2 mile was a lifetime best for the Jamaica Patton trained gelding. A win tonight would be the 30th in the 5-year-old’s career for owners Ron Phillips of Athena, Illinois and Sherry Boledovich of Lakewood Colorado. Regular driver Ryan Anderson is back to guide Primed N Powerful. The trotter’s significant post shift from the pole position Sunday makes the task of a repeat victory much more difficult and he takes on six opponents with the credentials to come out on top. From the one slot out you’ll find Bo I See Time (Kyle Wilfong), Trixie’s Jethro (Jared Finn), All About Cowboys (Jim Lackey), Lous Credit Report (Mike Oosting), Louscipher (Tim Curtin) and Picky Picky Valor (Casey Leonard), the Gerald Hansen trained ICF 4-year-old coming off a 1:54.3 triumph a week ago. The sixth race second trotting feature is comprised of Overandovervictory (Steve Searle), Fox Valley Shout (Wyatt Avenatti), Annas Lucky Star (Kyle Wilfong), Bands Houdini (Mike Oosting), Silverhill Volo (Jim Lackey), Schwarber Tim Curtin) and Patton (Casey Leonard) who had been talking on stronger fields at Yonkers Raceway in New York for trainer Frank Petrelli. Patton will open at odds of 6-5. Sharing the Sunday limelight are the second round series of the Tony Salvaro for fillies and mares and the Phil Georgeff for colts and geldings. The $8,000 Salvaro will get the program started with its eight-horse field headed up by first leg victor Star Of The Show (Casey Leonard). The Rick Schrock trainee meets First Official, Theresareason, My Kind Of Terror, ICY IYQ, Itsnotme Itsmen, Deo’s Perfectsound and Rosebud’s First. The $8,000 Georgeff goes as race six and after Pop Speed’s (Tim Curtin) dominating four-plus length victory in round one, the Dale Knox trained gelding likely will be a heavy favorite again. Looking to turn the tables tonight on Pop Speed are Party’s Jet, Maki’ A Move, Forsumeoddreason,Turner Image, Fort El Said and Tarasenko. No Sweat: Unbeaten Fox Valley Gemini (Casey Leonard), the 2017 Illinois Harness Horse of the Year, hardly broke out in a sweat in his 3-year-old debut last night at Hawthorne, pulling away by almost four lengths in 1:55.1 with a 26.2 last panel. The Terry Leonard Stable’s star pupil grabbed an easy lead from the one-slot, coasted to a 30.1 first quarter, went unchallenged a soft 1:00 flat half and then blew away his five ICF sophomore rivals in the lane for his tenth win in a row, this one at prohibitive 1 to 9 odds for owner Jim Ballinger of Atwater, Illinois. A Bombshell Winner: The shocker of the night came in the second leg of the Mike Paradise series when Fox Valley Sinful, saddled with the 10-hole in an 11-horse field, came from far out of it and popped at 70-1 odds with Kyle Wilfong in the bike. The Joel Smith trained 3-year-old paid off at a $142.20 mutuel with his 1:55.2 maiden victory. In the second Bob Larry split the Gerald Hansen Stable’s Et Tu Brute ($22.60) was sent to the top by driver Robert Smolin, and was nicely rated to a career fastest 1:55.3 mile. The 10-1 longshot, owned by Bernie and Deb Paul of Oregon, Illinois, finished a length and a half ahead of Lyons King. Same Outcome The Open III Handicap Pace for fillies and mares turned out to be a repeat of last Saturday’s feature as Pretty Image ($4.40, Tim Curtin) and Narcian Jewel (Tyler Shehan) ended up one-two again, in that order. Rodney Freese trains the 1:55.3 winner Pretty Image. Point Made: Last night’s Hawthorne mutuel handle of $754,072 was almost $100,000 more than it was a week ago on Kentucky Derby night with its 45 minute earlier first post. Both Saturday programs had 12-race programs. Jim Ballinger’s Fox Valley Gemini, the unbeaten ICF freshman who went on to be named the 2017 Illinois Harness Horse of the Year, makes his 3-year-old debut Saturday night at Hawthorne. While the star of the Terry Leonard Stable hasn’t been postward since his Night of Champions victory in the $195,000 Incredible Finale Final last September, Fox Valley Gemini showed more than enough in his May 13 qualifier at Hawthorne that he’s ready to begin his sophomore campaign and extend his nine race undefeated winning streak. The son of Skyscraper out of the Cole Muffler broodmare Epona easily won his Hawthorne qualifier in 1:53.3 with regular drive Casey Leonard, pacing rather effortlessly the last quarter in 27.3. Fox Valley Gemini leaves from the pole position in an $8,000 ICF prep with Backstreet Lawyer on his right. The Tom Simmons trained does have the benefit of a start a week ago, breezing in 1:54.2. Molina, Fox Valley Hijinx, Dandy Dude and He’s A Real Shooter are the other challengers. There’s also an $8,000 prep race for 3-year-old state-bred fillies on the Saturday card that is made up of a strong quartet from last season’s freshman distaff crop including the 2018 debut of Fox Valley Jazzy (Ridge Warren), winner of Hawthorne’s $175,000 Incredible Tillie. 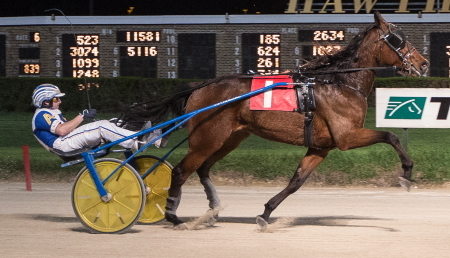 Rollin Coal, Allbeastnobeauty, and The New Americana, the two, three and fourth place finishers on the Night of Champions finale will take on the Dale Kanitz trained Fox Valley Jazz, an eight-time winner in her first season. Also going to the gate in the fourth race filly pace is Party Belle, JB’s Shooting Star and Sheincrediblenasty. Saturday’s headliner is the third race Open III Pace (handicapped by groups) for fillies and mares, bringing out an eight horse field comprised of Wings (Tim Curtin), Triple Lane Melody (Ryan Anderson), I Prance U Dance (Kyle Wilfong), Bucklegirl Bobette (Kyle Husted), and last week’s one-two finishers Pretty Image (Tim Curtin) and Narcian Jewel (Tyler Shehan). A sizzling 26.2 last panel saw Pretty Image eke out a neck decision over Narcian Jewel in the initial Open distaff pace of the meeting. Still to be decided are the finalists for next weekend’s Bob Larry Late Closer Series Final. First leg victors Sagebrush Shocker and Beach Shooting Star have locked up a starting berth in the final with their first round wins and they’ll meet in the third race Bob Larry split against Sheriff Coffey, Rocknroll High, Skyway Fireball and You’remyhearthrong. The sixth race second $8,000 Bob Larry division will see Platinum, Jades Truth, Et Tu Brute, Lyons King, Renegade Express Intuitive Writer and Rockin Celebration slug it out. The second leg of the Mike Paradise Series will go as a single division this time unlike last week’s first leg. The sixth race does have 11 starters including first round winners Sports Analyst (pp 2, Jamaica Patton) and Special Sauce (pp 6, Ryan Anderson). Both of the first leg Paradise winners will advance to next Saturday’s showdown. Hoping to join them are Herecomesmagotta, Sagebrush Sharp, Piscotty, U Makin Me Wait, Ricky The Flash, Dandy’s Phoenix, Fox Valley Brutus, Fox Valley Sinful and Fox Valley Jala who starts tonight in the second tier. Coming Out Ready: A three month layoff didn’t make a bit of difference to the Terry Leonard Stable’s Trashytonguetalker’s in Friday night’s $10,000 Open Handicap pace feature, The 6-year-old gelding sped to a 1:51.3 clocking for driver Casey Leonard as the 7-5 public’s choice. 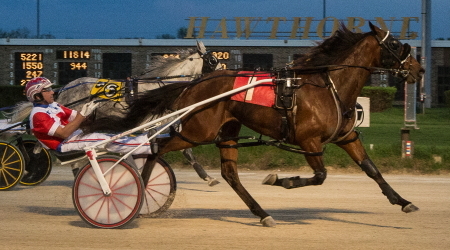 Account Hanover (Kyle Husted) was second best, beaten a half-length. The 10-1 longshot Gabe Henry (Ridge Warren) shook loose in the lane just in time to nip He Gone Jack by a nose in the $7,200 Open III Pace with a 1:52.2 clocking. Trained by Tom Graham Jr, the 4-year-old ICF homebred uncorked a blistering 26.1 final panel for his Salem, Illinois owner Carol Graham. In second round action of Friday’s Late Closer events, Ryan’s Mistress ($6.40) made it two-for-two in the Dave Magee Series, again nicely handled by driver Juan Franco. The 1:57 flat mile was a career fastest for the ICF 3-year-old filly trained by Roshun Trigg. A few races later Totally Pazzazzed ($11.60) from the barn of Rodney Freese pulled off a mild surprise at 4-1 odds in round two of the Bea Farber trot for driver Tim Curtin with a 1:57.3 mile in front-stepping fashion. The Brett Wilfong trainee Never Say That (Kyle Wilfong) won his second consecutive Daryl Busse Series trot and showed a lot of determination doing it. The 4-year-old gelding too command t the first quarter pole and then had to hold off a game effort by the first over Broadway Mojo (Isaac Love) as the Trenton Watson trained trotter battled the 3-5 winner the length of the stretch. In the tenth race Walter Paisley series the 14-1 longshot Princess Oshie made up 10 lengths in the last quarter of the mile and popped at $30.60 with her trainer Richard S Finn at her lines. 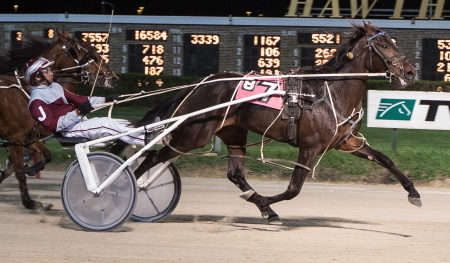 The 1:54.4 mile was a career fastest for the 5-year-old mare owned by Walk On Water Racing. November Rain was second, beaten 1 and 1 /2 lengths. The 6-5 favorite Fox Valley Catwalk went off stride and ended up distance. Are There More Series Surprises? When the 3-year-old ICF filly Ryan’s Mistess last week swept past the field, in the last quarter of the mile to capture the opening leg of the Dave Magee Late Closer Series at 27-1 odds she obviously stunned a lot of horseplayers. Maybe her new driver Juan Franco might have been a bit surprised as well. After all, the Guatemala native didn’t know a whole lot about the home bred Flacco Family Farms filly before he got in the bike behind her. Ryan’s Mistress spent her 2-year-old season almost exclusively on the Illinois County Fair Circuit, going postward 21 times and winning two starts. The filly raced for Ronnie Gillespie at the Hawthorne winter meet and could only manage one small check, with a non-threatening fourth place finish in a low-end maiden-claimer. She was a far back eighth and sixth in her other two tries, both conditioned events. Franco didn’t drive the filly last month in her Springfield prep. He didn’t even warm up the horse before her Magee series start. Did he get a chance to talk to her current trainer Roshun Trigg before the race? By the half Juan found himself in seventh place in the 10-horse field, not exactly in a great spot. At the three-quarters Ryan’s Mistress was fifth but more than 10 lengths off the leader. The 1:58.1 winning mile locked-up a starting berth in next week’s Dave Magee Final. In tonight’s second series leg, Ryan’s Mistress will leave from the seven-post in a seven-horse field. Inside of her in Friday’s opener are (programmed odds), Little Adaline (4-1), Frontier Red (7-2), Jazzy Bern (25-1), Piana (3-1), Ruby Doobie (20-1), Tempest Heart (6-1) and Fox Valley Eurofic (25-1). Ryan’s Mistress opens at 5-2. Friday’s feature arrives early on the 10-race card. The third race brings out a company five-horse field of Open I pacers handicapped by groups (1-3) and (4-5). Each starter has the credentials to take the $10,000 headliner. No. 1 Hot Rod Dylan (Juan Franco), was a 12-time winner last year for the Nelson Willis Stable and comes off a solid effort at Hoosier, his first outing in almost seven months. Fox Valley Nemitz (pp2, Kyle Wilfong), a former ICF stakes champion, was third in an Open II Pace in Indiana for trainer Tom Simmons and that followed a three month layoff. The Jim Eaton Stable’s Account Hanover (pp 2, Kyle Husted), shipped in from Ohio, where he was a two-time winner earlier in the year. He’s no stranger to the Chicago circuit and boasts a 1:50 career fastest mile taken at the Meadowlands as a 4-year-old. The Terry Leonard Stable’s Trashytonguetalker (pp 4, Casey Leonard), has been a fan favorite at Hawthorne. The 6-year-old gelding finished the winter meeting with four consecutive victories, including the February 11 Open Pace. His 1:53.3 winning qualifier eight days ago, signifies he’s ready for a big effort tonight. The Perry Smith Stable’s Feelikearockstar (pp 5, Tyler Shehan), was a consistent purse earner in recent Opens at Miami Valley Raceway in Ohio. The 6-year-old gelding already has over $56,000 on his season card and has had past success on Hawthorne’s big track. An Open III Pace is the secondary Friday feature and it has a full field of 10-pacers. 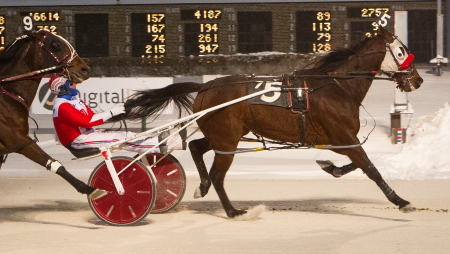 Last week’s Open III victor He Gone Jack was assigned the 10-hole by the Race Office after his 1:53.2 triumph. The Ray Hanna trainee has some tough foes inside of him this week. From the one-post out you’ll find Yankee Bounty, Best Man Hanover, American Dreamer, Gabe Henry, My Friskie Boy, Extravagant Art, Fox Valley Reggie, Jewel Maker and Bettor’s Promise. Lous Silver Star (programmed at 9-2,Tyler Shehan), guns for her fifth win in a row for trainer Roshun Trigg, in the fourth race second leg, of the Bea Farber Series for trotters, when she takes on Dr Spengler (12-1), Southern Appeal (12-1), Totally Pazzazzed (7-2), True Detective (5-2) and Bazaar Bazaar (2-1), again. The other trot series on the card is the sixth race Daryl Busse, where again The Brett Wilfong Stable’s Never Say That, drew another outside post. However, last week it was the 10 in a 12-horse field. This time around it’s No. 7 in a 7-horse field. Round two of the Walter Paisley series is the Friday nightcap. The 2-1 first flash favorite, Fox Valley Catwalk, goes after his seventh consecutive triumph and his second in the Paisley, The Rodney Freese owned and trained ICF pacer barely got the job done a week ago, edging Princess Oshie (opens at 10-1), by a head and the third-place finisher C Far (6-1), by a half-length. A newcomer to the second leg of the Paisley, is the Jim Lackey Stable’s Rockinroundheaven (12-1), who made the long trip to Hawthorne from Cal Expo in Sacramento, California. The other Paisley hopefuls are Real Sheila (15-1), Beamer N Bud (8-1), Island Campaign (20-1), November Rain (5-2) and Wimple’s Dimple (20-1). 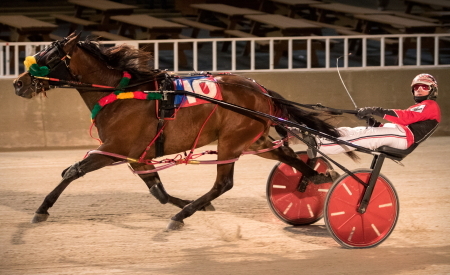 The opening legs of the Cicero Claiming Series with $6,000 price tags also get under way tonight. The two divisions for fillies and mares will go as race two and five. The eighth race is round one for horses and geldings and it landed a nine-horse field of $6,000 claimers. On A Roll: Casey Leonard brought home four of the eight winners on Thursday’s card. That gives the 40-year-old Harvard, Illinois native, 13 first place drives on the last three Hawthorne programs. If you’re wondering if last Saturday’s Hawthorne’s earlier-than-normal 6:30 pm first post on Kentucky Derby Day was a success . . . it wasn’t. It was a flop. The idea that by moving the first race post closer to the finish of the Kentucky Derby has been around for decades and there was a time it worked out fairly well. However, that was when our sport was much more popular and the full-card simulcasting of dozens of other race tracks weren’t available. But like the typewriter, the rotary phone, a muscle-car that gave you 7 miles on a gallon of gasoline, those things are long gone, and so should the moving around of a racetrack’s first race post. Last Saturday saw less than $20,000 bet on Hawthorne’s first race. A little more than $22,000 was bet on the second race and both events were solid conditioned races with $6,500 purses. The third race, a seven-horse field of $6,000 claimers, went off at 7:25 pm had had $41,000 bet on it, about the same amount as races one and two put together. As per the norm the wagering pools continued to rise as the night went on. The last two races that went off at 10:40 pm and 11 o’clock handled over $75,000 and $90,000, respectively. If Saturday’s first two races were contested after 11 pm instead of the much-too-early 6:30pm first post they would have handled four-plus times more money and the horsemen’s purse account would have been better off. Since it was the first weekend of the meeting, there was only opening night Friday for Hawthorne to try and “push” Saturday’s early post. Also, racetracks continue to believe that by putting something on their web-site and/or their TV signal, the entire harness racing betting nation will take notice. With 14 other horse racing simulcasting signals being telecast from all over the country when Hawthorne’s earlier first Saturday race came around, I doubt the switching over to watch the Illinois harness racing product wasn’t a high priority on horse player’s minds. The Hawthorne Kentucky Derby night handle was a disappointing $659,783, probably the lowest total you’ll see on another Saturday card at the summer meet with 12 races completed. Sunday’s first race low-end $4,000 conditioned pace (7:15 off-time), saw twice the money wagered on it than on Saturday’s opener. For the night, over $260,000 was bet more on Sunday, despite having one less race on the program, than on Saturday. A one-time good idea isn’t always such as time goes on. Hawthorne should leave well enough on future Kentucky Derby nights. Don’t mess with its first race post. It’s Not Too Late: The initial Thursday night card of Hawthorn’s summer meet kicks off the second week of live racing on the big mile track. Leg two of eight Late Closer Series, are on tap for the weekend with four on Friday and two each on Saturday and Sunday. The top 10 point earners in each series advance to next weekend’s finals. Points are awarded are a 50-25-12-8-5 basis with a single point given for starting. Since, there are only two rounds, the first place finishers in last week’s opening legs have wrapped up start berths in the finales. That would be Lous Silver Star (Tyler Shehan), in the Bea Farber trot series, Never Say That (Kyle Wilfong), in the Daryl Busse trot, Fox Valley Catwalk (Tim Curtin), in the Walter Paisley pace, and Ryan’s Mistress (Juan Franco), in the Dave Magee. Casey Hot: Hawthorne’s defending driver champion Casey Leonard had himself quite a weekend. Casey followed last Saturday’s five winning drives and five seconds with four more first place horses Sunday and four more second place finishers. The opening legs of the last two Late Closer series and an Open III Pace with a strong contingent of ICF horses are the headliners on the initial Sunday card of Hawthorne’s summer meeting. The $8,000 Tony Salvaro and the $8,000 Phil Georgeff, honoring two of the past popular Chicago circuit announcers, will go as back-to-back events (races 6 and 7), on the 11-race program. Both Late Closers are for 3 and 4-year-olds without $10,000 in earnings through March 31st of this year. The Salvaro is for fillies or mares, while the Georgeff is a nine-horse field of colts or geldings. They’ll be proceeded by the fourth race $7,200 Open III Pace, a six horse field evenly matched contest with the first four slots belonging to the state-bred pacers Gabe Henry (Ridge Warren), Dinky Dune (Tim Curtin), He Gone Jack (Casey Leonard) and Fox Valley Reggie (Jamaica Patton). The Illinois owned (Shirley Levin of Barrington Hills) pacers Jewel Maker (Juan Franco) and Extravagant Art (Kyle Wilfong), have the 5 and 6 slots, respectively. Both horses are trained by Nelson Willis and chalked up victories during Hawthorne’s winter meeting. The Tom Graham Jr’s Gabe Henry, now a 4-year-old, racked up seven victories in 11 tries as a freshman including a streak of five in a row. The home bred son of Henry Clay was second in the Springfield Final, after winning his elimination and then took a division of Du Quoin’s Governor Cup for owner and breeder Carl Graham of Salem, Illinois. Dinky Dune, owned and trained by Dane May of Newton, Illinois, busted out as a 3-year-old capturing both the Cardinal Final at Balmoral and the Dudley Hanover at Du Quoin before proving best on Super Night 2016 in the $112,000 Pete Langley Championship. The 6-year-old son of Duneside Perch took the Springfield ICF Aged Stake in 2016 and last summer added the Du Quoin State Fair aged pace championship. He Gone Jack (Casey Leonard), a 5-year-old under the care of trainer Ray Hanna, was a two-time winner in conditioned races this past winter at Hawthorne. After a 10 week layoff, the Richess Hanover gelding showed readiness for Sunday’s outing, with a 1:54.2 win in an April 21st Springfield Preview event, pacing the last quarter in 27 seconds flat with Casey for Joplin, Missouri owners Hugh Lake and Susan Lacey. The three early programmed favorites in the sixth race, first round of the Salvaro—Indiana invaders Star Of The Show (2-1, Casey Leonard), ICY IYQ (3-1, Isaac Love) and My Kind Of Terror (7-2, Mike Oosting)—each have had success on the Hoosier Park oval. Star of The Show won there as a freshman in 1:57 flat for the Rick Schrock Stable. The Trenton Watson trained ICY IYQ had the same winning time, when he took a series consolation race a month ago and Adrian Adam’s, My Kind Of Show, won an Indiana claiming series event on April 17th. Theresareason, Rosebud’s First, Deo’s Perfectsound and Itsnotme It’smen are the other Salvaro series aspirants. The Hawthorne program lists Pop Speed (Tim Curtin, 8-5) and Another Bettor (Kyle Wilfong, 2-1), as the Georgeff pre-race favorites. Turner Image, Tarasenko, Party’s Jet, Makin’ A Move, Miracle Mike, Forsumoddreason and Fort El Said are the other 3 or 4-year-old ICF male pacer candidates. Pop Seed takes a substantial class drop Sunday night, out a higher level event at Hoosier Park for trainer Dale Knox, while Another Bettor was a game winner in a $10,000 Claiming Series Final, his second triumph in four recent Indiana starts. Surprise Surprise: Last night’s Open III headliners, one for filly and mare pacers and the other for trotters, both produced upset winners. Rodney Freese’s Pretty Image (Tim Curtin), put on a strong 26.2 last quarter burst to nip the 3-5 favorite Narcian Jewel (Casey Leonard), at the finish wire in the distaff Open Pace. 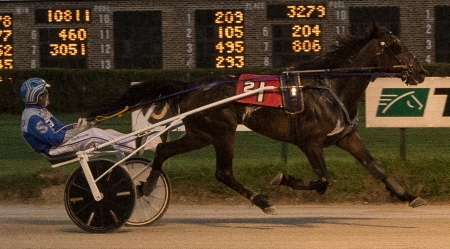 Buckegirl Bobette (Kyle Husted), had a game first-over effort to be third in the 1:54.1 mile. One race later, a bigger surprise occurred, when the Jamaica Patton trained trotter Primed N Powerful rolled on by in the stretch 17-1odds and popped at $36.60. Patiently driven by Ryan Anderson, Primed N Powerful, raced in third throughout the race and when called on at the top of the lane, the 5-year-old gelding got into high gear and drew off by four lengths. The 1:54.2 mile was a career fastest for Primed N Powerful. Anderson was back in the winner’s circle in the next race, the first division pf the Mike Paradise Late Closer Series with the even-money favorite Special Sauce, trained by Kim Hamilton for Illinois owner Orville Rursch (Taylor Ridge). Ryan put Special Sauce on the front end soon after a modest 30.2 first quarter and the Sagebrush gelding held off the pocket horse U Makin Me Wait (Casey Leonard), by a half-length in the opening leg of the series for 3 and 4-year-old male pacers. The 4-5 public’s choice Sports Analyst didn’t disappoint his many supporters in the second Paradise split. Trained by his driver Jamaica Patton the Sportsmaster sophomore bested Herecomesmagotta (Tim Curtin), by a half-length with a 1:55.3 clocking. The opening leg of the $8,500 Bob Larry Series went to the Tom Simmons trained Beach Shootingstar ($3.60), capably handled by Casey Leonard. The time of 1:53.3 knocked off almost three full seconds off the winner’s previous mark. In the second Larry Smith Sagebrush Shocker ($13.20) got his head in front of the favorite You’remyhearthrob at the finish wire. The 1:54.2 mile was the Ken Rocker trainee’s fourth season triumph and was one of five winning drives for Casey Leonard, who also had five second place finishes on the 12-race card.